1.1. Who can play Play&Gold? 1.2. Not a Pay&Go customer yet? 1.3. I have a code, what now? 1.4. How do I get a code? 1.5. I topped up but didn’t get a code. Why not? 1.6. How long is my code valid? 1.7. Does it cost anything to play? 1.8. I picked a gift but I haven’t received it yet. What should I do? 1.9. What’s the Play&Gold small print? 1.10. I don’t know my mobile phone number. 1.11. I can’t open any pages or links on the Play&Gold website. 1.12. I don’t have the time to play. / I don’t like games. Is there another way to receive free minutes and SMSes? 2.1. How long is my code valid? 2.2. When will I receive my code? 2.3. Can I use my code more than once? 2.4. I don’t have internet. How do I play? 2.5. It’s been over 24 hours and I still haven’t received my code. 2.6. My Play&Gold code doesn’t work. 2.7. I’ve lost my code. What should I do? 2.8. My session crashed. Is my code lost now? 2.9. 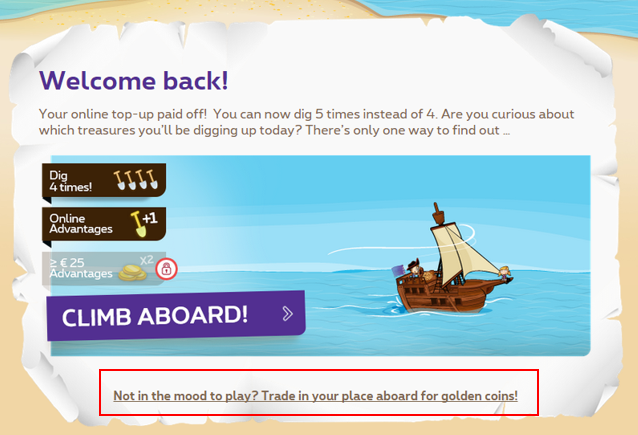 How can I redeem my gold coins without reloading? 3.1. What kind of treasures can I dig up? 3.2. How many times can I dig per session? 3.3. What is a ticket? 3.4. Do I win something every time I dig? 3.5. How do I know I’m not digging in the same place as before? 3.6. What is a collection? 3.7. How can I complete a collection? 3.8. How do I find gold coins? 3.9. Can I win extra gold coins? 3.10. What can I do with the gold coins? 3.11. How do I know how many gold coins I have saved? 3.12. When can I exchange my gold coins for a gift? 3.13. I am not able to simultaneously order multiple gifts. What should I do? 3.14 I have gold coins on several mobile phone numbers. Can I gather them on one mobile phone number? 3.15 I would like to give some of my gold coins to someone else. Is this possible? 4.1. What is the Piratapult contest? 4.2. Why participate in the Piratapult contest? 4.3. What can you win with the Piratapult ? 4.4. What exactly is the Super Treasure? 4.5. How can I play the Piratapult game? 4.6. How do I know if I’ve won a prize in the Piratapult? 4.7. I have reached the milestone of 1,500 meters. What now? 4.8. How do I know when the Super Treasure contest is about to finish and the Super Treasure is about to be allocated? 4.9. What's the Piratapult final? 4.10 What if I can't participate to the Piratapult final? 4.11. Are the results of the Piratapult final published? 5. The treasure chamber and prize catalogue. 5.1. How long does it take to get the free text messages or minutes added on my phone? 5.2. How long does it take for my gift to be delivered? 5.3. My physical prize is damaged. What can I do? 5.4. I don’t like the gift I chose. Can I choose another one? 5.5. Can I transfer my bonus to another mobile phone? 5.6. Can I have my prize delivered overseas? 5.7. I don’t think my bonus was granted. How can I check this? 5.8. I have chosen “Free calling minutes to a Proximus number” as a network bonus. How can I check if I’m calling a Proximus number? Any Pay&Go customer can play the game! Top up for at least €15 to play the game. Sign up now so you can join in the fun. Surf to www.proximus.be and go to “All prepaid cards” under the tab “Mobile” for more information. Go to the homepage of the Play&Gold website, enter your mobile phone number and your code and click on “Connect”. Do not forget to tick the box “I accept the terms and conditions” before logging in. Simply top up with an amount of €15 or more. We'll text you a code within a few hours. You'll receive a new code each time you top up for at least €15. This is probably because you’ve topped up for less than €15. You can only receive a code to win a prize with top-ups of €15 or more. Next time, top up this minimum amount. Please also note that the number of Play&Gold codes is limited to 8 codes per customer, per calendar month. If you’ve topped up with the minimal amount of €15 and you have not yet reached the limit of 8 codes per month, you will receive a code within 24 hours. If you haven’t received a code within 24 hours, we suggest you call our customer care team on the number 6030 (toll-free from you Proximus-gsm). You have 31 days, starting from the day you top up, to use your code. Only the price of a top-up of at least €15. A network bonus will be granted to you within 24 hours. You will receive a confirmation message when your bonus is activated. Please call our customer service on 6000 (toll-free from a Proximus mobile phone) if you have not received this gift after 24 hours. For other gifts, you will receive an e-mail within 24 hours with more information about your gift. If you do not receive an e-mail from us, check your spam folder. Your spam filter may have stopped our message. Otherwise, contact us via the contact form available on the homepage (playandgold.be). If you received an e-code from us as a gift but lost the e-mail in which this code was sent, log in via the homepage using a valid Play&Gold code and your mobile number, and ask for your e-code to be sent again by pressing "Send again" under "Chosen gifts". You can consult the Terms and Conditions (T&Cs). You need to confirm that you have read and accepted the Terms and Conditions before you can play the game or collect your prize. Check the packaging that your SIM card came in. Your number will be on it. You can also type the code #122# on your mobile and press send; you will receive a message with your mobile number. The pop-up blocker on your Internet browser may be switched on. Check the instructions next to the toolbar and click to allow pop-ups. We understand that you may not always have the time or inclination to go on treasury hunt, but it should not prevent you to receive a reward for your loyalty! Jimmy Chase, the infamous treasure hunter, would like to buy your place aboard the ship for 25 gold coins. If you agree, simply click on the link "Not in the mood to play?" and you will immediately receive 25 gold coins and be granted direct access to the gift catalogue. However, in doing so, you will miss the opportunity to win Super Treasures with the Piratapult or collect additional gold coins. If you do not want to participate in Play&Gold, and therefore no longer want receive texts related to Play&Gold, send "STOP" by SMS to 8930. If you want to register again, send "START" to 8930. Generally, you will receive it within 15 minutes; however, sometimes it can take up to 24 hours after topping up for at least €15, which is the maximal delivery time. No. You can only use your code once to dig for treasure and take part in the Piratapult competition. However, you can reuse your code to log in at a later time. This is handy if you want to check your balance or choose a gift. You can't play without the website, so ask a relative or friend if you can use their computer. First, check that your top-up amount was above €15, since you can only receive a code with this minimum amount. If this applies to you and you still haven’t received a code within a timeframe of 24 hours, you can recover your last code by pressing “Need a code?”-link on the homepage. Your last code will be sent to you as quickly as possible, provided it is still valid. Check that your phone number and code were entered correctly and that your code has not expired (it is valid for up to 31 days after the top-up). Every mobile display is different. If you have doubts, try replacing the "U" with a "V", or the "I" with an "L". If you still have problems, call 6030 (toll-free from a Proximus mobile) or contact us via the contact form on the homepage. You can retrieve your last code by pressing the “Need a code”-link on playandgold.be and entering your mobile phone number. Your last valid code will be sent by text message within a period of 24 hours. If your last code expired, we will send you a new code that will just allow you to log in to redeem your gold coins or adapt your personal details. No. Go back to the homepage and log in as usual. The game will resume where the previous session ended, provided your code is still valid. You no longer have a valid code? Don’t worry! Press the "Need a code?" button and we will send you a new code, which gives you access to the treasury chamber and your personal profile, within 24 hours. You still have a valid code but you completely forgot about it? So much the better! Who knows, you might discover a forgotten dig. Play&Gold is a treasure hunt for an attractive hoard made up of coins, a Piratapult championship ticket and multiple objects to form a collection. Gold coins can be immediately exchanged in the treasure chamber for a network bonus, saved for later, or offered to someone you know. If you find a Piratapult championship ticket, you can participate in the Piratapult competition. Each time you top up for €15 or more, you receive a code to participate. If you top up via a top-up card, you can dig four times. If you top up via 1-2 ring, 1-2 surf or automatic top-up, you can dig five times. A ticket gives you access to the Piratapult competition. You can dig up as many treasures as you have turns to dig. Try to choose a good place to dig because sometimes you only get an empty hole. In each session, you resume the previous game. This is, after all, a real treasure hunt and Rome wasn't built in a day! You can look at all the gold coins and collectibles you have collected when you log in again. The places where you dug during a previous session (i.e. the boxes you checked) will also be clearly indicated. A collection consists of a number of collectibles. The collection is complete when you have found all five collectibles. Each collection is different. Some collections are rare and you receive lots of gold coins for them. Click the backpack in the bar above the playground. Here, you can see the status of all your collectibles. A collection completes itself. You just have to be lucky when you dig. There are several ways to find gold coins. You can dig a certain number of times during each session. Many gold coins lie hidden under the sand. If you find a collectible instead of a gold coin, this can also bring you gold if you can complete a collection with that object. You can get the largest number of gold coins with the Piratapult. Different types of turtles are floating around in the water. If one of your pirates hits one of these turtles, you are rewarded. If you achieve a top score, you'll be covered in gold! Yes. Extra gold coins can be won in the Piratapult competition. If you throw a certain distance, you win the amount of gold coins corresponding to this distance. Moreover, turtles are placed at specific intervals in the water. If one of your pirates hits one of these tortoises, you get extra gold coins. The amount of gold coins won, will be transferred to your account after playing the game so you can immediately exchange them for a gift in the treasure chamber. Gold coins can be immediately exchanged for a nice gift in our treasure chamber. You can also decide to save your gold coins and exchange them for a gift with a higher value later on. Or you’re in a generous mood and offer them to someone else. Or you’re in a generous mood and offer them to someone else. When you log in with your personal code and mobile number, you will see an overview of the number of gold coins you have collected. This overview can be consulted at any time, as long as your code is valid. You have no valid code left? Don’t worry. You can request a new code using the “Need a code”-link on the homepage. You can exchange your gold coins for a gift of your choice any time you like. So you don't have to do it right after digging or playing with the Piratapult. You can log in again with a valid code at any time to consult your coin balance or the gift catalog. Please note that the gift catalog may change after a certain period. However, network bonuses are always included in the gift catalog. You have no valid code left? Don’t worry. You can request a new code using the “Need a code?”-link on the homepage. If you wish to order more gifts at once, you return to the homepage after each gift choice and you log in again with the same code before choosing a new gift. 3.14. I have gold coins on several mobile phone numbers. Can I gather them on one mobile phone number? Yes. If you have gold coins on several mobile phone numbers, you can easily transfer them to one mobile number by following the link 'Transfer your gold' in the Treasure Chamber. Simply log in with the mobile number on which you have gold coins and go to the Treasure Chamber. 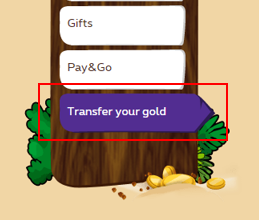 Follow the link 'Transfer your gold', enter the number of gold coins you would like to transfer and enter the mobile phone number that you would like to receive them on. 3.15. I would like to give some of my gold coins to someone else. Is this possible? Yes, it is. You can give all of your gold coins or part of them to any Pay&Go phone number that has played at least once with Play&Gold. All you need to do is log on to www.playandgold.be with your mobile phone number and a valid code. In the Treasure Room, you follow the link 'Transfer your gold’ and enter the number of gold coins you want to offer and the mobile phone number of the recipient. The Piratapult contest is a game of skill that is played with a pirate catapult, better known as the Piratapult. During the competition you can instantly win a large number of gold coins or a ticket for the live Piratapult final, where besides the Super Treasure multiple other prizes can be won. In the game, you have to throw three pirates as far as possible by calculating the force and direction of the Piratapult. The number of gold coins you win depends on the distance you threw. If during the game you hit a red or green turtle, you win extra gold coins. The Piratapult contest is also known as the Super Treasure competition because the highest prize is the Super Treasure. All participants throwing a distance of 1,500 meters or more are invited to the live Piratapult final where all the best players will compete against each other. The person that registeres the best result during this final, wins the Super Treasure. In the Piratapult contest you can win the Super Treasure. And who wouldn't want to win this coveted prize? Challenge: throw your pirates 1500 meters or further and get an invitation to the live Piratapult final! Even if you don't have a top score, you don't go away empty-handed. There are multiple milestones yielding gold coins. If you reach one of these milestones, you win the number of gold coins corresponding the distance you threw. Moreover, if one of your pirates hits a red or green tortoise, you get extra coins. If you want more information about the exact number of coins you can with and the prizes that will be distributed during the live Piratapult final, take a look at the “Terms and Conditions” . 4.3. What can you win with the Piratapult? The Piratapult allows you to win additional gold coins and/or an invite to the live Piratapult final. You can win additional gold coins by touching red or green turtles or by throwing a certain distance. Please consult the “Conditions” at the home page for more information about the distance and corresponding number of gold coins that can be won. All participants throwing 1,500 meters or more win an invitation to the Piratapult final. Gold coins will be transferred to your account immediately after playing the game. If you win an invite to the final, you will instantly receive a notification of that as well. During each campaign Proximus hosts a contest to win the Super Treasure. The Super Treasure is a travel voucher of a certain value. You can win the Super Treasure by launching your 3 pirates as far as possible during your participation, by reaching the 1500 meters milestone and by getting invited to the Piratapult final. The contestant who registers the farthest throw wins the Super Treasure. It is to your advantage to top up several times during a competition period for with every new top-up you will get a new possibility to throw your pirates, get an invitation to the Piratapult finale and win the Super Treasure. Read the “Small Print” on the top right of each page of the Play&Gold game for more information about the duration of the contest. To play the Piratapult game, you must first dig up a Piratapult championship ticket. After each game, so after having thrown away your 3 pirates, you will see a score board with your result and your gain. You immediately know what your throw is worth. You don’t need to undertake any further actions. The gold coins you’ve won during the game will be transferred to your account automatically, enabling you to immediately exchange them for a gift. If you win an invite for the live Piratapult final, an e-mail containing all the details will be sent within 24h to the registered e-mail address. If you have thrown 1,500 meters or more, you are one of the better Piratapult players and you will be invited to the live Piratapult final where you can win the Super Treasure. Immediately after your score, you will receive an e-mail in which we congratulate you on your result. Your result and contact details will then be retained until the end of the contest period (see "Terms" for more info). The date, location, start time of the final and a participation form will be sent to you by e-mail, in the week after the end of the contest period. Each competition has another running time. Take a look under the "Terms" for more information about the start and end dates of the current competition period. 4.9. What is the piratapult final? The Piratapult final is the final round that will be held among the players who were able to reach the 1 500 meter milestone and are thus considered to be the best players of the previous contest period. The final will be organized on location along with the other winners. At the start of the Piratapult final all results are put back to zero. The player with the best result will win the Super Treasure. The other participants win the other prizes. Check the "Terms" on the home page to see what prizes can be won this contest period. 4.10. What if I can't participate to the piratapult final? If you are one of the lucky ones that received an invitation to the Piratapult-final but are not able to free up that day, you may send a representative who participates in your place, provided that they are 18 or older. You will get the opportunity to share the name of your representative in the reply form at your invitation. Yes. You can view the results of the previous Piratapult final via this link. It can take up to 24 hours to have your network bonus (texts, minutes) activated on your mobile. This happens automatically. We will send you a confirmation message (SMS) to let you know when this has been done. Once you have chosen a gift with your gold coins, you will receive a confirmation e-mail within 24 hours containing a description of your prize and all the necessary information regarding the method and time of delivery. If you have any questions or problems, please contact our customer service via the contact details provided in the e-mail. When you see your package is damaged, do not accept it. We will send you a new package. Proximus/Belgacom cannot be held responsible for material damage that has been caused to the package through delivery. If you have chosen your gift and confirmed your choice, you will not be able to change it. If you have not yet done so, you can browse through the prize catalog and read the description under each prize. No, the bonus is exclusively for the number that was topped up. However, if you want your friends to benefit from the program, tell them about it. If they are not yet Pay&Go customers, they can start receiving codes and prizes by buying a Pay&Go SIM card and topping up for at least €15. No, it can only be delivered to a Belgian address. You can check your personal usage via the online e-Services, a personalized customer environment which gives you more control over the Proximus/Belgacom services you have subscribed to. If you do not use the e-Services yet, you can activate your account here: https://admit.belgacom.be/ . The website http://www.1299.be gives you access to a public database which allows you to easily obtain the number location of the called person.